The front axle experiences tremendous amounts of lateral force while turning and those effects increase exponentially during off-road driving. 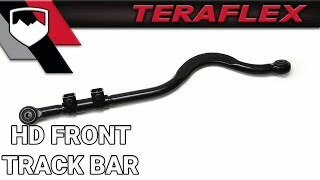 The TeraFlex JK/JKU Heavy-Duty Forged Adjustable Front Track Bar is engineered to withstand these abusive side loads and eliminates any front-end shimmy or handling issues. It also allows lateral adjustment of the axle for proper axle alignment as well as cycling through full suspension travel without interfering with other components. Our Heavy-Duty Forged Adjustable Front Track Bar is 230% stronger than the stock piece making it the strongest track bar on the market! • Replacement bushings (# 835770) available individually. Added one of these to my 2015 JKUR to compliment a TeraFlex 2.5" coil lift. I was able to easily center the axle perfectly and this thing is strong! The front of my Jeep feels solid and the steering feel is precise,. Be easy on the pinch bolts/nuts that lock down the adjustment collar, especially if you put anti-seize on them, as they can end up collapsing the clamps quite a bit before you hit the stated torque (80 ft/lbs). I've done 55-60 ft/lbs during later adjustments and it seems to work great. Great part, would recommend to friends! I bought this after watching Dennis's video. Lol. I figured after throwing 37s on my jeep and lifting it 4.5 it would be a smart choice, and it sure was. I didn't notice how much slop I had in my steering until this beast was installed! Tightened up the steering and gives my jeep a very stable feel. Definitely recommend! I installed the Monster front trackbar today and I have to say it is pure beef and the easiest adjustable trackbar I have ever installed. It is literally a 10 minute start to finish job. awesome job Teraflex. Since I was spending so much money on doing everything I got this to go with the lift. 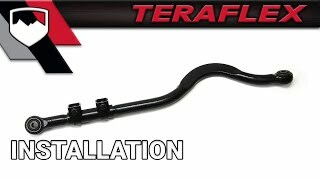 I have been so impressed with Teraflex on products that I have been putting on as much as possible and this is definitely an improvement over anything stock so how can you go wrong spending the little extra money to make things sturdier. This track bar is easy to install and takes the flex you feel in your steering out of the picture. Whether a long high speed turn on a highway or off road, this baby will make steering your jeep feel more stable and controlled. I almost waited to install this when I did my lift but I'm glad that I went ahead with it. I did the rear track bar as well! BUY THIS TRACK BAR, plus the rear track bar and bracket. This equipment is a must for anyone running 35/12.50's in my very humble opinion. You don't have to be crawling over boulders to benefit from these track bars. If you need to drive over 60 mph, just buy them and thank me later. I have a 2017 Rubicon with 3.25" lift and 35/12.50's. Drove well after the lift/tires, but felt a little "loose" especially at speeds above 60 mph. Minor bumps/dips in the road at higher speeds significantly affected the steering and comfort. I found myself gripping the wheel and anticipating every imperfection in the highway. Adding the Teraflex front and rear track bars plus relocation bracket has made a TREMENDOUS difference. The steering is tighter. Bumps at lower speeds are less jarring. Steering, ride, and responsiveness at 60 mph + is night and day compared to the factory track bars. I feel my Jeep is safer thanks to these track bars. Good heavy duty track bar and works great when it works. Less than 1500 miles and barely a year old and the Diff side bushing is shot.. And this was all street driving.. almost no offroad. Was expecting a much better life span from this track bar..